A Challenge with a Huge Difference-Is it possible to take a straight line route across Britain? 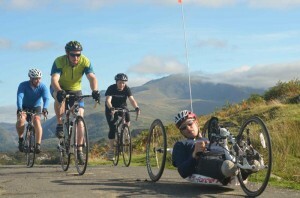 The Challenge called “Beeline Britain” is raising money for BLESMA. Lands End to John 0′Groats would be a challenge to many of us, but this Challenge is one that has never been attempted before! On May 18th a team of four started on there mission. It took numerous months of planning, training, overcoming obstacles for Beeline Britain to happen! So what is so different & why are they attempting this? Many of us have met Nick Beighton, now a retired Captain after having spent several years in the Royal Engineers. Nick came to our meeting last December & gave a very thought provoking & inspiring talk about His life before & after becoming a double, above knee amputee the result of stepping on an Improvised Explosive Device (IED) while on duty in 2009 in Helmand Province. After Nick’s talk, many of you commented on how inspiring He was, it even challenged some of us by making us look at our lives differently. So inspired, I know some of you are following the Beeline Britain journey of Face Book, but I have decided to share this with you as not all of us use Social Media. We all know to take the traditional route from Lands End to John 0′Groats is a big challenge that is used by many people as a way to raise money for charity. 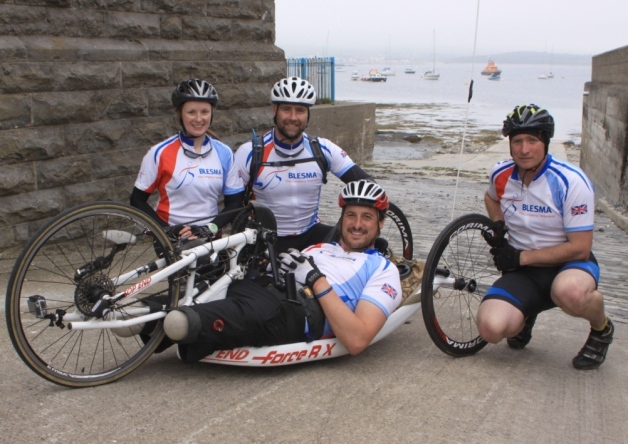 This challenge is so different as to complete Beeline Britain, the team will have to travel 1,100 km on some of the UK‘s most difficult terrain, it will involve 100 hours in a kayak, 34 hours on a bike and over 12 hours on foot. The journey will be completed by sea kayaking, hand bike/road bike as well a mountaineering! Places along the route include the Isle of Man, Burrow Head, Lossiemouth, Wick. plus a section of mountaineering over the Cairngorms plateaux, one of the most exposed mountain ranges in the UK. It really does sound impossible. Team Beeline Britain is made up of Tori James, aged 25. She became the youngest British woman and the first Welsh woman to climb to the summit of Mount Everest. Adam Harmer another team member is a senior lecturer at Liverpool John Moores University and professional outdoor instructor at the UK’s National Mountain Centre, Plas-y-Brenin. RAF helicopter crewman, Ian O’Grady is another team member. Ian is 37 and originated from Oswestry. Then 32 year old Nick is the fourth team member. This challenge is being supported by The Endeavour Fund (created by The Royal Foundation of The Duke and Duchess of Cambridge and Prince Harry), and will raise money for BLESMA, the charity for limbless servicemen and women and their families. They aim to raise £20,000 for BLESMA, the limbless veterans’ charity which supported Nick after his accident. Nick suffered serious multiple injuries and needed extensive rehabilitation. Last December Nick during His presentation told us “Having no legs is a driving factor behind everything I do. It is not an excuse to do nothing, it’s a reason to do more”. The trickiest part of this challenge for Nick is the kayaking as usually this sport is so reliant on a persons legs to brace and balance the boat. To overcome this He designed a false bulkhead, built to support His stumps underneath, enabling them to be in the correct position to help stabilise the kayak. For cycling Nick will use a made to measure handbike enabling Him to reach speeds of 80mph, allowing him to cover 120km a day. That is not all because on the mountaineering part of the journey Nick will use special crutches that he bought from a company in America, He then adapted these in His own garage so that they will be able to cope with the load going through them. For Nick, his upper body strength is vital. This is one amazing challenge, they have already reached Linn of Dee in Aberdeen. (7th June 2014) Throughout their training in preparing for this epic challenge many radio stations and newspapers carried out interviews. Along the way Beeline Britain support team have been out and about meeting locals and promoting BLESMA as well as encouraging the team as they pass through each area. Now Beeline Britain is on the final part of the challenge, we should be hearing new radio interviews and see new press releases however, if you want to see how the team are doing, even donate go to www.beelinebritain.com This website is updated daily and has a wealth of information to be read. 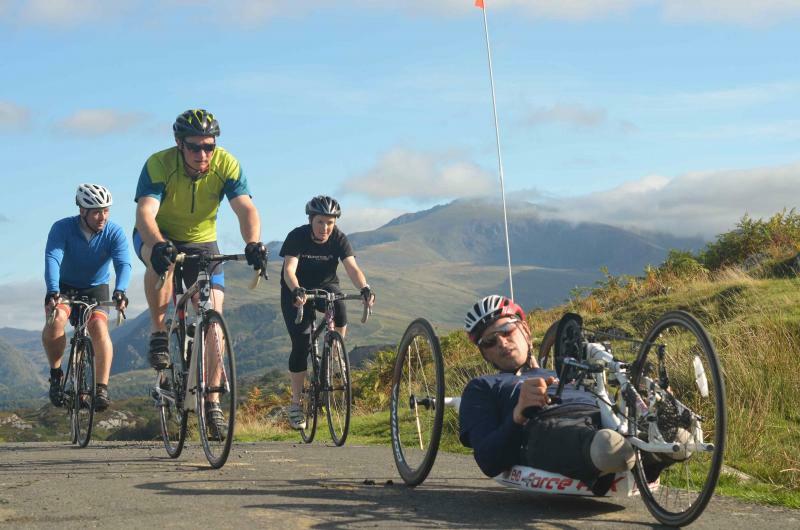 Shropshire Disability Network wishes Nick & Beeline Britain all the best and when time allows, we would be pleased to have a blog from them about their epic to share with our members. Photograph shows Tori James, Ian O’Grady, NickBeighton and Adam Harmer while on part of the journey via Isle of Man. This entry was posted in Blog on June 9, 2014 by penval.